When off the red carpet, he is known for his laid-back, casual style. 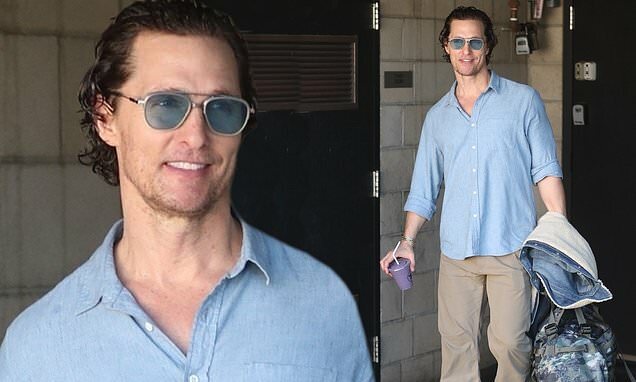 And on Thursday, Matthew McConaughey stayed true to his style when he stepped out in West Hollywood. The Oscar-winning actor was seen looking refreshed and relaxed following a workout session at an LA-area gym. Matthew paired a denim button-down with a set of khaki pants. The 49-year-old's curly hair was brushed back and away from his face. The handsome actor accessorized with a pair of glasses and a watch. The father-of-three carried his gym bag and a coordinating denim jacket in one hand, and a healthy smoothie in the other. Despite his shining star spot in Hollywood, the actor's relaxed style - and personality - could be in part to his southern roots.